This age-old fascination with photographs, contemporary residences and semi-minimalist trends are altering the way we look at adorning our walls with prints. Decorating with black and white photography is seeing new heights thanks to improved cameras and the growing inclination to use neutral colors and muted tones. Consider building your art arrangement vertically to add extra height and intrigue to a small-scale series. 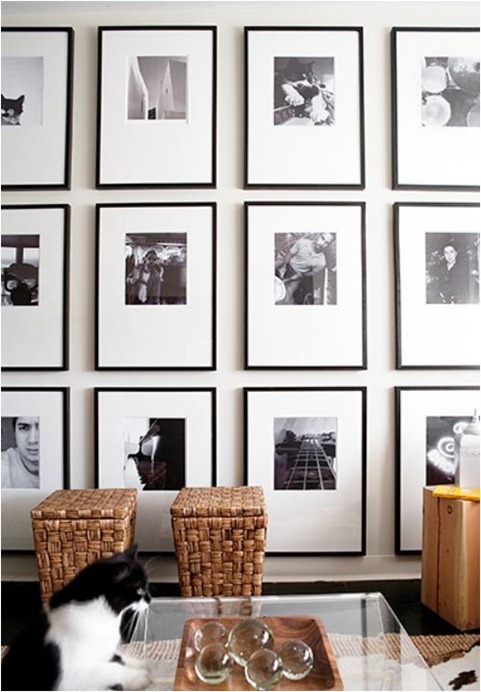 When it comes to displaying photographs, and you cannot go wrong with black and white – they are undeniably classic and oh so sophisticated when gathered in a group on display. Here is a collection of great books to get you started on your food photography and food styling for food bloggers, amateurs and professional photographers wishing to take better food photographs. Based on her 30 years of experience in food styling for advertising, magazines, books, and films, Delores Custer presents the definitive lifelong reference on food styling-complete with lists of handy tools and vital equipment, recipes for artificial foods, and guidelines for running a successful food styling business. Full of ingenious advice on styling in any media and packed with full-color photographs, Food Styling reveals every trick of the trade, from making a beverage appear to sweat to producing those perfect grill marks on meat without a grill. Filled with resources and organized in a simple problem-and-solution format, this is an ideal resource for both experienced foods styling pros and first-timers alike. Whether you’re looking to break into the food styling business or just touch up on the latest and most effective techniques, Food Styling is the ultimate guide to creating stunning culinary visuals. Tips and techniques for making food look good—before it tastes good! Food photography is on the rise, with the millions of food bloggers around the word as well as foodies who document their meals or small business owners who are interested in cutting costs by styling and photographing their own menu items, and this book should serve as your first course in food photography. Discover how the food stylist exercises unique techniques to make the food look attractive in the finished product. You’ll get a taste of the visual know-how that is required to translate the perceptions of taste, aroma, and appeal into a stunning, lavish finished photograph. “You eat with your eyes first,” and no one turns a photograph of food into a culinary masterpiece like a food stylist. Food Styling for Photographers is the next best thing to having renowned food stylist Linda Bellingham by your side. Linda has worked with clients Baskin Robbins Ice Cream, McDonald’s, Tyson Foods, FritoLay, and many, many more. Professional photographer Jean Ann Bybee has worked with Harry & David, Dominos, Sara Lee, Seven-Up Company, and more. Jean Ann provides a seasoned photographer’s point of view with helpful tips throughout. If you are hungry for unique photo assignments and want to expand your portfolio, this guide provides the well-kept secrets of food styling techniques that can make your photos good enough to eat. Each chapter covers step-by-step instructions with mouth-watering photographs illustrating techniques for the creation of hero products that photographers at any level can whip up. Are you a “foodie” looking to take eye-catching photos of your culinary concoctions? Do you have a food blog that you’d like to enhance with better visuals? Do you want to create photos that conjure up the flavors of your favorite foods but lack the photographic technique to make it happen? Then this book is for you! In Food Photography: From Snapshots to Great Shots, photographer Nicole Young dishes up the basics on getting the right camera equipment–lights, lenses, reflectors, etc.–and takes you through the key photographic principles of aperture, ISO, and shutter speed. She then discusses lighting and composition and shows how to style food using props, fabrics, and tabletops. Finally, she explains how to improve your photos through sharpening, color enhancement, and other editing techniques. Beautifully illustrated with large, vibrant photos, this book offers the practical advice and expert shooting tips you need to get the food images you want every time you pick up your camera. Acclaimed food stylist Denise Vivaldo shares the tips and secrets of the trade with cooks who want to become master stylists. It takes a steady hand to arrange the chocolate curls and drizzle the caramel sauce in elaborate designs on top of that sumptuous tiered cake. Whether for food blogs, television, books, magazines, movies, menus, or advertising, food stylists and photographers learn to slice, plate, tweak, and arrange so the dish becomes less a bit of food and more the work of an artisan. In the old days of film photography, photographers often carried around a handful of filters. Because white balance was baked into the film, one would often have to correct for various light sources using filters. The film itself was balance for the yellowy warm indoor lighting or the cool bright white of sunlight. Going from indoors to outside or visa verse required changing film or adding a filter to your lens to cool or warm the light. Black and white photographers would use colored filters to effect certain color ranges. For example a red filter would be used to make some serious tonal changes: pink and orange go almost white while the deep red displays similar values to the original orange. While the blue and green become very dark. In the age of digital photography, white balance is not longer a worry and can be changed in post production if you are shooting RAW files. Other filter effects can be achieve using software such as Adobe Lightroom, Photoshop or OnOne Perfect Effects. A polarizing filter is used to cut glare off windows or water just like a pair of polarized sunglasses. A UV filter doesn’t do anything in the digital age except add a layer of protection to your lens. A polarizing filter can increase color saturation in landscapes it removes glare off leaves. A circular one allows you to dial in the right effect. A UV filter can be used all the time. A polarizing filter should not as it takes away one stop or so of light. Also in wide angle shots you can get an uneven effect across the sky. Just bring out the polarizing filter when you need it to cut glare. Graduated filters – If the sky is too bright you can use a graduated filter to darken the sky. Neutral Density or ND filters – Neutral Density filters darken the scene without changing the light. You can get them in various strengths or get a circular one that can dial in the intensity. Why would you want to darken a scene? The primary reason is to be able to use longer exposures for smoothing out waterfalls to get that silky water look. I love old cars. Beautifully restored or rusting junkers, I never miss the opportunity to capture a beautiful old vintage car. Either as a nostalgic throwback to a yesterday that I was too young to remember (except in the movies or TV show) or simply as documenting beautiful textures of pitted metal, cracked rubber and rust – my camera and I are there! 1. Watch out for reflections -The shiny waxed finishes on a restored vintage car can be a nightmare to photograph because of all the reflections. Often the photographer ends up in the shot! Time to be creative with angles as well as being on the look out for distracting elements such as reflections. 2. Get in close for details – Fins, wheels, emblems, interiors, engines – there are all kinds of details that can be captured on a beautiful old car. Besides typically at at car show its hard to get the whole car with all of the people milling around. 3. Ask for permission – At car shows you might notice that the car owners get a bit nervous when you approach their car. Basically this is their baby and they spend a lot of time polishing and buffing these beauties. What they really don’t want to see is someone marring the finish with fingerprints or horror of all horrors, scratching the finish with a belt buckle. Be friendly to the owners and chat them up a bit. Gain their trust and them perhaps they’ll be more inclined move the “for sale” sign or take out their lunch from the back seat so you can get a great photograph. 4. Get creative with angles – Go low, go high, get an interesting angle. 5. Get creative with crops – You don’t always have to show the whole car. Get creative with cropping. 6. Have patience – In a crowded car show or even on a cloudy day when the light is constantly change is pay to have patience. Come back to the same car on different occasions to see if the crowd is gone or plan to come early when the show is opening to avoid crowds. 7. Be ready at all times – Finding vintage cars in a beautiful natural setting is the greatest thrill of them all, at least in terms of vintage car photography. Twice now I have come across a beautiful vintage car parked at the shore. 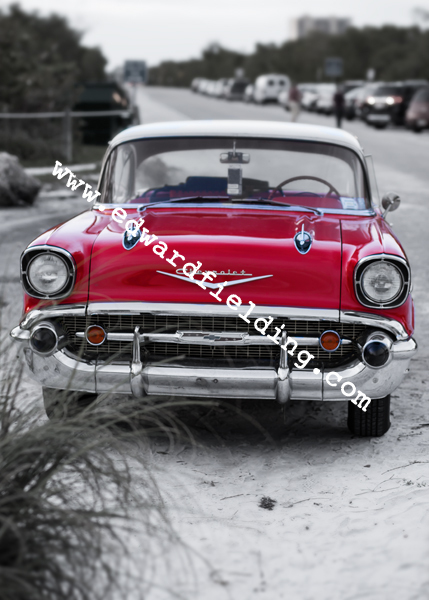 Once in Victoria-by-the-sea where a cute Minor 1000 was parked on the pier and recently down in Fort Myers, Florida where I found a mint two-tone red and white Chevy BelAir parked right up next to the beach. It was in a handicap spot and we had just been leaving the beach after snapping the sunset. Driven to parking lot by a swarm of no-see-ems, this beautiful vintage car was just sitting their basking in beautiful dusk light. I had to move quickly to get a number of shots trying to keep distracting elements such as garage cans and signs out of the shot and I saw the owner walking back from the beach. Be prepared and have your camera with you at all times! I have a passion for still lifes! They certainly are tougher then they look. Good ones look effortless. Some have suggested that they want them to look like they just happened rather than were carefully arranged. This shot was a response after seeing the beautiful window light in one of Amy Weiss’s fantastic images. I built this shot up with a fake background wall made of rough pine boards. The “table” is the back of an old clock. Then the wire basket with apples and the rustic plates with main apples in the front. The “hero” apples are placed in one of the golden intersections of the rule of thirds. The apples were place to reflect light in a certain way. Also I studied some old master’s paintings and noticed how much more interesting the bottom of the apple can be. Many of the paintings I checked out showed the bottom of the apple. I think the little extra details like the dried leaves and the rough edges of the plates are what give something like this a bit of umph. Also the three largest apples form a triangle with move the viewers eye around in that bottom left region. I used a studio light. Small softbox directly from the left. I blocked out some of the light towards the back to keep the background darker. Poster board on the right to bounce some fill light back in.